Your support of the Michigan Humane Society (MHS) has helped save the lives of 52 “bonded” animals in the last year. Bonded animals are those that must stay together given their close relationships. But arguably no animals have ever shared a closer bond than Brooke and Vinny — the newlyweds. Residents and staff at Cedarbrook of Northville wanted to save animals, and have fun, so they got creative. 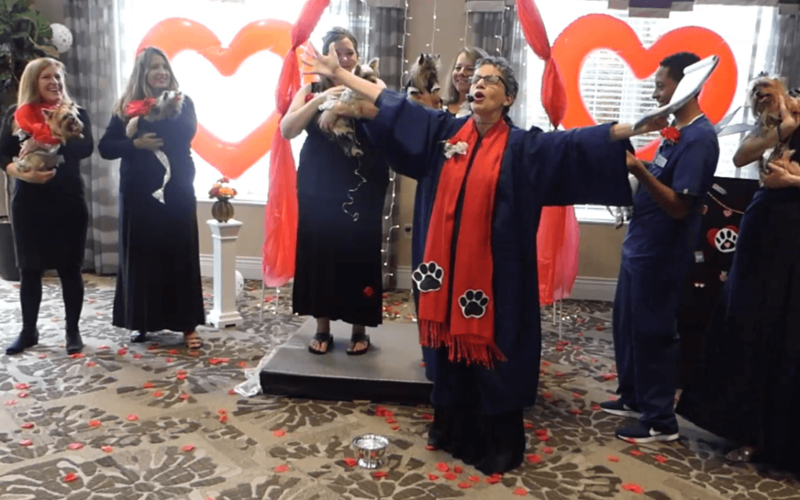 They organized a wedding ceremony for their resident Yorkie named Brooke, which you can watch below. This event attracted about 80 spectators who watched an 8-dog bridal party scamper down the red carpet. That is where a minister joined Brooke and Vinny in holy matrimony, followed by wedding cake and entertainment. In the process, people donated more than $650 to MHS. They also supplied many items on the charity’s gift registry, all while sharing a good laugh. If you are ever in Plymouth, please congratulate Brooke and Vinny. However, please don’t “hound” them. Rumor has it the happy couple is on honeymoon in New Yorkie.